It is the prayer of every couple to welcome their bundle of joy nine months after walking down the aisle or few years after. Some prayers come through while some women end up giving up their lives in the process of welcoming a new being. 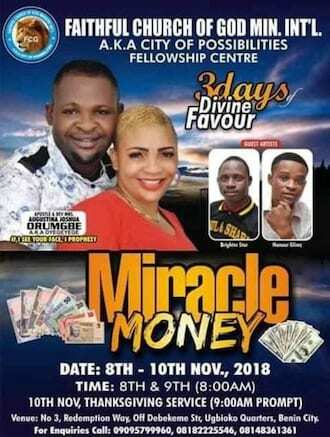 The Benin pastor died just few days before her church program, Miracle Money which was widely publicized by her husband Apostle Joshua in Edo state. The deceased who was identified as Reverend Augustina Drumgbe but popularly known as Oyegeyege, is the founder of The Faithful of God Ministry International. It was further reported that Rev Drumgbe died on Sunday, November 4, after suffering complications during childbirth. Her husband took to his social media handle to share the terrible news amongst his followers. A Twitter user identified as Deedeeposh recently narrated the sad situation surrounding the death of her late 44-year-old aunt. According to Dee, the aunt had been married for 19 years with no fruit of the womb but got finally blessed with twins. The expecting mother was few moments away from motherhood before a self-made decision cost her life. In another report, it's indeed a trying time for the family of late Ifot Lovemary, who recently gave up the ghost. A family member identified as Favour Ifot shared the news on Facebook, where she revealed that the young woman died tragically during childbirth.